Making your own bridal bouquet makes this wedding tradition even more special and unique. This is a guide about making a bridal bouquet. Confused by all of the choices there are for a bridal bouquet? I have tried hard to make each wedding I ever designed (34 years designing) special and unique to each bride. If you are not sure what type of bouquet to carry or trying to save some on cost, take all of the cards and love letters and notes that you saved from your groom and tie them together. Have some one make a fabric "envelope" to match your colors. Slide in all of the cards and letters, use a button to close it off. Have the florist make a larger "corsage" with trailing ribbons and attach it to the top of the "envelope" with corsage pins. This will truly give you a bouquet unique to you alone as no one else has the cards and love notes as you do from your beloved. This is sentimental and very elegant, all the while being very cost effective as well! Say nothing to your groom until you are at the altar or after the ceremony. Tell him that you carried these items with you as they mean more than any bridal bouquet ever would and you get to keep them as well, secure in their special "envelope"! You may even choose to have the envelope embroidered with your names, initials, a sentiment, your wedding date etc. Best of luck on your wedding day. Source: It was my idea, you have to be creative when dealing with brides that all want a wedding unique to themselves. Here is an alternative to florist prices for flowers. While I don't have a photo I am sure you will get the idea! My son is getting married in April and the wedding is on the cheap. What I did for bouquets is the following: took a toilet paper roll and inserted Styrofoam to fit snugly. Then I inserted silk flowers on stems into the Styrofoam, arranged as needed, as well as, then inserted Baby's Breath and greenery under the flowers. Then I wrapped the toilet paper roll with color coordinated ribbon (including the underside), pinned the end of the ribbon with pearl headed straight pins directly through the toilet paper roll into the Styrofoam. Viola! Instant bouquet! This takes about 15 minutes per bouquet and looks like a designer bouquet for pennies! I saw a beautiful item on one of David Tuterras Bride Shows. He made the most gorgeous bouquet for the bride to carry instead of flowers. It was completely made from vintage brooches, costume jewelry, earrings that had no mates. He found most at flea markets and garage and estate sales. I am telling you I don't think I have ever seen anything as beautiful as what was created just using broken and mismatched jewelry findings. This is a hand tied bridal bouquet I made. Being a certified wedding planner, I keep my business "all inclusive"! I sometimes am the florist too! Thank goodness the days of HUGE Bridal bouquets has passed! 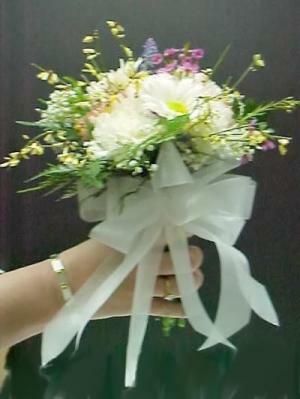 Small, round bouquets with stems showing are being used more often in Weddings. Your local florist would be glad to bunch up a cluster of roses and tie with ribbon but believe me you'd pay dearly! I'm getting married in August and I'm looking for some patterns to go by on how to make my own bridal and bridesmaids bouquets. I'm on a very limited budget and I'm trying my hardest to get everything and make it myself with help from my wedding party and close friends. My wedding colors are Victorian lilac, purple, periwinkle, and white. I was wondering if someone has suggestions on flowers and flower colors, too. I hope there is someone on this site who can help me. Thanks for your time. It would be very easy to make them yourself! You could use any flower that is complementary to your colors and dress style. Roses are more formal, daisies, gerbera daisies more casual. Talk to the florist about colors, hardiness (don't get anything too fragile), etc. Find out what kind of flowers will be available for a good price at that time of year. Gather them together arranging nicely, cut the stems off the same length, and use a nice ribbon to wrap the stems, finishing with a knot or bow. It couldn't be easier! Google "nosegay" and check out some pics. You CAN do it yourself and they'll be beautiful! As a silk wedding flower designer and certified wedding planner for over 10 years, I have a couple of suggestions and tips for you. I would suggest creating a simple hand-tied bouquets. To be more formal, reduce the amount of greenery and choose a single large bloom and accent with baby's breath or stephanotis. For a more casual look; grasses and mixed smaller blooms work well. Also, you have 2 basic color scheme options when creating bouquets. 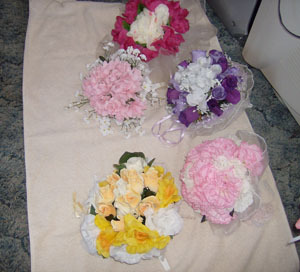 (1) Make all the bouquets the same in terms of flower colors and mixes, but perhaps make the brides larger in size. 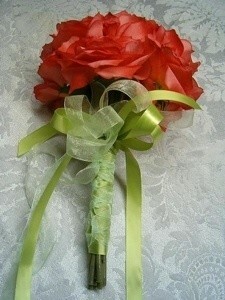 (2) Make the brides bouquet different by style, color, and/or flowers, yet all the bouquets should look complimentary. So if for example your bridesmaids are wearing Victorian lilac, than reserve that color for the brides bouquet and use the remaining colors in the bridesmaid bouquets. This way the bouquets will stand out on their gowns and match the overall wedding color scheme. To stay within your budget here is what I would suggest for flowers and colors. If you have access to a Sam;s Club or Costco they are happy to order bulk flowers for a great price. Baby's breath & Stephonatis in white as accent flowers. Carnations (Purple) - these in mass look really high end. If you have further questions, let me know. I am glad to help. Congrats on your upcoming wedding. I wish you continued succes in your planning. For my daughters wedding I made the bouquets, something I never did before. All were made the same way but each girl had a different number of flowers. The handles were made using toilet paper tubes. I covered them first with thin white fun foam, then with wide white ribbon. Then using a 1/4 ribbon I wound that around the tube with space between each wind around the tube. I used a bit smaller ribbon and made tails to hang from the bottom of the tube. The flower girl had 5 flowers, the jr. bridesmaid had 7, the bridesmaid had 9, the maid of honor had 11 and the bride had 15. The tubes themselves are free, and the ribbon I bought when there was a sale. All the flowers were bought on sale at a craft warehouse type store. Every one wanted to know who did the flowers. My daughter had fun saying they are fake and my mom made them. They were a big hit. Congratulations on getting married and wanting to keep costs down. If you don't mind silk flowers, you might want to consider using some mixed with real flowers. I do this when I get a fresh bouquet from the florist. As some flowers don't last as long as others, i.e., roses, delphinium, daffodils, etc. I replace the droopy ones in the bouquet with silk ones. 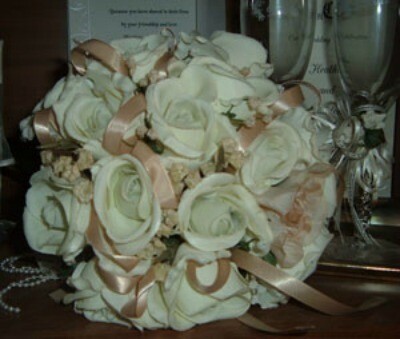 It prolongs the life of the bouquet and it looks just as fresh one week or more later. I keep a box of silk flowers I've used in my bouquets ready for the next one I receive and always have something on hand to replace wilted ones. Specific flowers in your colors may be hard to find fresh and would be very expensive such as lilacs for example. You could purchase silk lilacs and mix them in with fresh daisies, carnations, mums and even roses. Congratulations on the upcoming wedding. If you are fine with artificial flowers I would suggest checking out Wedding & Party Scrap. 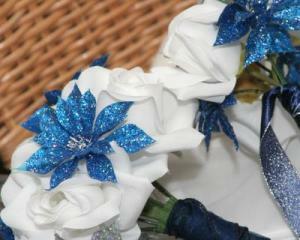 You can view their products at www.weddingandpartyscrap.vpweb.com. I got my wedding flowers from them and they were great. Everyone thought they were real and it was very inexpensive! This is a photo of my wedding flowers from there. My daughter wants to use lavender at her wedding. Has anyone ever used it in their bouquet? Maybe with some baby's breathe? We used wonderful fresh lavender that we bought on ebay for my daughter's wedding. We used it in the bouquets & the table decorations. The smell was wonderful & everything has stayed fairly bright & with that great smell for several years (spray a bit with hairspray to keep everything together nicely). We paid about $100.00, but it was a huge amount of the lavender. Make sure if you order it, that you are getting the fresh stuff & not the dry kind. Good luck, I think you will be very happy with it. What a wonderful idea! Hope it goes well! Wish I had a daughter to share this idea with, too! Lavender in a bouquet is lovely and it smells divine! My sister-in-law had little tulle bags of lavender on the pews in the church. It made a wonderful smell as you entered! If you're using it in your bouquet, then it will preserve well afterwards as well. It will go well with irises or other small headed seasonal flowers. I was a floral designer for 34 years and have used lavender in many weddings and bridal bouquets. Make sure it is FRESH! or it will shatter all over and what a mess. In the bouquets to make more impact use "shocks" bunches tied or wired together and inserted in to the bouquet, this will give a statement for sure, if you are wanting it to be just an accent try using two or three stems and spread it all over the bouquet. I have done one bouquet that was ALL lavender with only 3 or 4 larger fresh or silk orchids in the center and trailing down was one additional one, you can make all lavender nosegays as well for the attendants, same for corsages just add a beautiful french wired ribbon and tadah! Boutonnieres are sophisticated made of only lavender and an ivy leaf to cover the mechanics (stem), elegant, different, cost effective and best of all you can make them yourself ahead of time and save the cost of a florist doing all the "personal " flowers. If you can arrange time and care use large pots of fresh growing lavender or pots filled with floral foam soaked and filled with cut fresh lavender for all centerpieces in a clay pot sprayed the color you like and also larger pots filled for the ceremony! Pews can be decorated with simple 5 loop bows with lavender hot glued into the centers. Good luck and it will be relaxing as well with the lovely scent of lavender filling the rooms for every one to enjoy! These are sample wedding bouquets that I made myself. Very pretty. I made mine myself too.